Every issue of the American Cichlid Association’s Buntbarsche Bulletin, from #1 to #296. Order now! $24.95 USD including shipping to US address. $7 USD shipping outside the USA. Enjoy a piece of cichlid club history with the first run re-printing of the American Cichlid Association’s Buntbarsche Bulletin issues #1-20. This book is available only through the ACA, all profits go to the Guy Jordan and Paul V. Loiselle funds. Order now! $35.00 USD plus $4.00 USD for shipping to US address, $22.00 USD outside the USA. 146, 148, 153-174, 176-265, 267, 270-273, 280-292. The following back issues in black and white are also available: 36, 39, 41, 46, 52, 54-58, 67-71, 73, 75-79, 83, 86-95, 97-99, 101-119, 121-122, 124-127, 129-133, 135, 140-142 and 144. 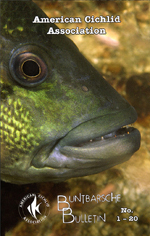 Check the Cichlid Room Companion for Buntbarsche Bulletin index. Order now! $4.00 USD per issue plus $4.00 USD for shipping to US address, $22.00 USD outside the USA (shipping price is per order). Important: Please add a note to your payment once you log in PayPal to include the BB numbers you are purchasing.